The first round of the NCAA Men’s basketball tournament ended last night with some expected–and some stunning–victories. Most shocking so far was the Ohio and Georgetown game. Did anyone else see that coming? I think every other upset could have been predicted, so unless you are from Ohio; let me know if you chose this #14 seed over the favored #3 Beast from the East team. Other upsets was #13 Murray State over #4 Vanderbilt, though this game wasn’t as big of a surprise as Murray State is a strong and athletic team and proved it with Donero Thomas’ buzzer beating shot. #10 Missouri over #7 Clemson 86-78. Do you have the right picks this March Madness to beat the sportaholic and all her friends? Well, it’s time to get in on the excitement with the NCAA Men’s Basketball Tournament with my challenge to you. Join my group— Charm City Sportaholic. 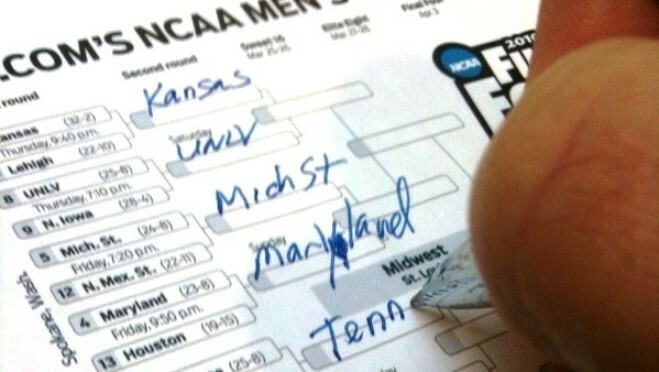 Fill out your bracket and check this blog for updates on the top scores every round. Is there a catch? You tell me: It is FREE to enter. If you beat me and are the overall winner, you get a prize from me. Many of you have already tried guessing the prize—beer, alcohol, a kiss, a Friendly’s sundae, a date with my sister or some other sexual things (you boys have a one-track mind). But it is a surprise, everyone. You want to know what I give the winner? Pick the best bracket and find out.